Along bus route 780 on Highway 1135, a massive pink structure grabs your attention as you stare wistfully out the window. 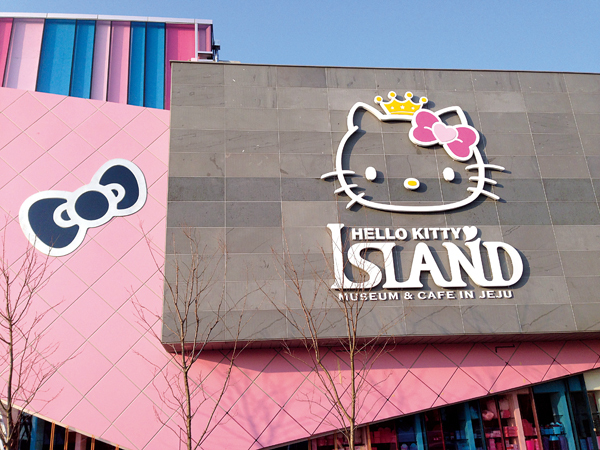 Declaring itself the largest permanent such exhibition in Korea, the giant feline character confirms this is the Hello Kitty Island, near the Teddy Valley Golf & Resort. Upon entering the grand hall, be prepared for massive amounts of pink and sparkle. There are also kids everywhere, so if you’re tall, like me, be sure to engage your lower-peripheral vision. It feels a lot like walking into a life-sized dollhouse, so if you’ve always wanted to star in “Honey, I Shrunk The Kids,” this would be a good start. However, if you aren’t a little girl, a little girl at heart, a very girlie grown up girl, or a rather effeminate man, you may feel slightly out of place. The two-storey Hello Kitty house is the first exhibit. It is like any other home except everything is pink and has a Hello Kitty face on it. There is holographic art on the wall leading to the foyer/dining room and even a fireplace with a giant fluffy pink Hello Kitty rug in front. The Hello Kitty kitchen has everything one would need, if one wanted all of one’s food to come out pink with whiskers. Proceeding further in, there is more of a museum feel, although more entertaining than inspiring. The “library” stocks only English for educational value and I particularly loved the full collection of The New Grove Dictionary of Music and Musicians! In the karaoke room, the last room on the first floor, visitors can sing and dance along with Hello Kitty or cheer on others. The second floor is a bit more magical, with iridescent flickering lights on a black ceiling, with Alice in Wonderland Hello Kitty and Red Riding Hood Hello Kitty. Visitors can board a pirate ship or enjoy a star-gazing room complete with Hello Kitty constellations and a giant whale to duck under and gaze up at kaleidoscopic images. After touring the magical and dark rooms, you exit into the bright fluorescent lighting of an art gallery. There are collectibles, poster, pictures covering the walls highlighting Hello Kitty in every situation, costume and art form possible. This is followed by Hello Kitty's bedroom and then a playground, all in pink, of course. After two large museum floors and a romp on the playground, you are likely to be getting hungry and want a sit down. Fortunately, the Hello Kitty cafe overlooks the atrium and Hello Kitty House on the second floor. Prices are reasonable and you might be tempted by the pricier Hello Kitty cake or waffle deluxe. All the while sitting on a Hello Kitty chair at a Hello Kitty table. After lunch, you can head up to the third floor to see the 6-minute Hello Kitty 3D movie. At the end, the screen opens to reveal an outer courtyard. Wander out, take a couple of pictures in front of the Hello Kitty lawn, enjoy the fresh air and view of Mt. Halla, before heading back inside. The only place left is the gift store, which sells everything “Hello Kitty.” There are school supplies, clothing and shoes, the obligatory wall of cellphone covers as well as other electronic items, cooking supplies, toys, stuffed animals and even a locked jewelry case for the more discerning buyer. You can even purchase Hello Kitty hard-shell, four-wheeled suitcases in two different colors and three different sizes to take home your new Hello Kitty goodies. It goes without saying: If you love Hello Kitty, this museum can’t be missed. However, even for the less-enamoured adult, the museum flows easily and is enjoyable to walk through. So, if pink sparkles and overly friendly cartoon cats don’t scare you away, give it a go! Tickets: 12,000 won (adults), 11,000 won (13-18 years), 9,000 won (children). Summer: 9 a.m. - 8 p.m.